Hillary’s Right, Bernie Sanders Isn’t a Mainstream Democrat. Here’s Why That’s a Good Thing. Everyone is quick to observe the defects of the Republican party; there are too many to list, and they are too obvious to miss. The party would be unrecognizable to earlier Republican presidents like Dwight Eisenhower, who, while no lefty, was sympathetic to the reforms of the New Deal and believed that government had a role to play in improving the well-being of American citizens. The rise of figures like Barry Goldwater, however, signaled a shift in the party’s ideological bent. It was a rightward lurch, a move that embraced the anti-government sentiment of figures like Ayn Rand and the free market principles elucidated by Milton Friedman, among others. The success of Ronald Reagan solidified this shift: Republicans became the party of Big Business, the party of tax cuts, the party of deregulation. While some believe the Republican party is once more experiencing a massive shift with the rise of Donald Trump, the dire predictions of the party elite are motivated more by Trump’s loose cannon personality than by his principles — if he can be said to have any. His tax plan, for instance, is right in line with Republican orthodoxy. With such easily visible chaos taking place on one side of the aisle, it can be easy to ignore what has happened on the other. But, as Thomas Frank suggests, the “party of the people” — AKA the Democratic party — has become much less so over the past several decades. Indeed, as the work of Thomas Ferguson has demonstrated, American politics has experienced a perceptible and significant “right turn”: Republicans have moved to the right-most edge of the spectrum (and some, perhaps, have fallen off said edge), and the Democrats have moved closer to the center (and some, perhaps, have even crossed the great divide). But no one really talks about it. Complacent Democrats are content to laugh at their opponents, and while they do so, they fail to notice the defects festering within their own party that could, if left unaddressed, cost them dearly. The fact that the rise of a candidate like Bernie Sanders was not predicted by those within the mainstream Democratic party is one sign of their failure to recognize public sentiment in the United States. They, like the Republicans, have become disconnected from the needs of the people, caught up in what is now the political necessity of catering to the business class. Since the emergence of Reagan, the Democratic party has seen it as a necessity to ride the wave he provoked: Bill Clinton, the first Democratic president to be elected after Reagan left office, embodied this new mentality. As Matt Taibbi notes in a recent column, Democrats have effectively adopted pieces of the Right’s agenda in order to win elections. The most prominent examples, of course, are Bill Clinton’s support for “welfare reform,” the 1994 omnibus crime bill, and NAFTA. While President Obama can point to many significant achievements that should not be downplayed, America’s middle class continues its decline, and the president alienated many among his base when he lobbied aggressively for the Trans-Pacific Partnership agreement — a “free trade” deal that environmental and labor groups argue will be disastrous for the planet and the working class and a huge gift to major corporations. And that brings us to the present, to a race that many view as a choice between the establishment and the “outsider,” between the experienced pragmatist and the grouchy populist. After remaining cordial for many months, the primary race between Clinton and Sanders has become increasingly tense. Faced with his growing momentum and intensified attacks, Hillary Clinton has recently — and once again — questioned whether or not Bernie Sanders is even a Democrat. Setting aside the weird “party loyalty” undertones, she is basically correct: He isn’t a Democrat, in her sense of the word; he isn’t, put another way, a mainstream, establishment Democrat. As I noted on Twitter, he falls more into the camp of FDR than Bill Clinton, a difference that Secretary Clinton, along with the rest of today’s Democratic party, has failed to perceive. In the process of questioning his credentials and parrying his critiques of her record, Clinton has insulted the intelligence of many who support him, including young people who she seems to believe lack the capacity to think for themselves. And, through her failure to adequately explain her deep ties to Wall Street and corporate America, she has alienated progressives who hold their party, and thus their party’s candidates, to a higher standard. Bernie Sanders, for his part, has rejected the neoliberal consensus that has been tacitly accepted by mainstream Democrats over the last several decades. He rejects corporate money; most mainstream Democrats fail to do the same. He is proposing tuition-free public college and a single-payer healthcare system. He has explicitly denounced the “war on drugs,” the only remaining candidate (excepting Gary Johnson and Jill Stein) to do so. He has tirelessly condemned Wall Street’s culture of greed and criminality. He has openly ripped the two-party system, saying that it limits debate and competition. He has vowed to ban fracking and to take swift action to address climate change. He has articulated a foreign policy that breaks with the established norms of American unilateralism and interventionism. 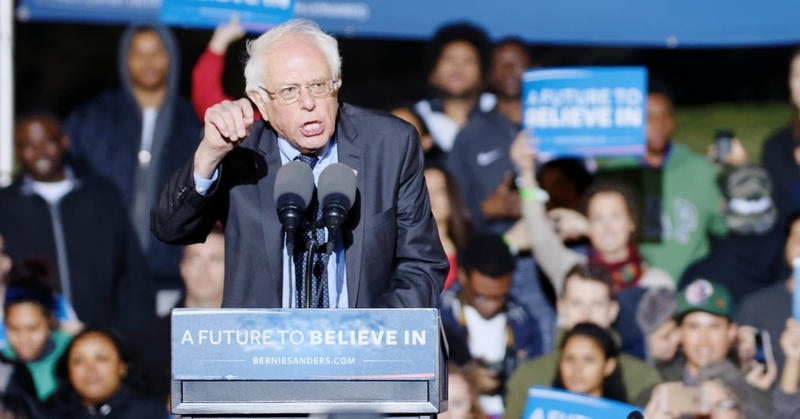 While he remains behind in the race for the nomination, the Sanders campaign is likely to spark a movement of sorts, one that forces the Democratic party to contend with its internal defects, something they clearly did not expect to be forced to do. So yes, Hillary Clinton is right to question Bernie Sanders’s credentials as a “Democrat,” in her sense of the word. He represents a break from the established order and an uncomfortable, but necessary, wake-up call to a party that has lost its way. Sanders has been deemed a radical by many who he would otherwise consider allies. But he is no radical; he merely embodies the principles that the Democrats have abandoned, at the expense of the people.